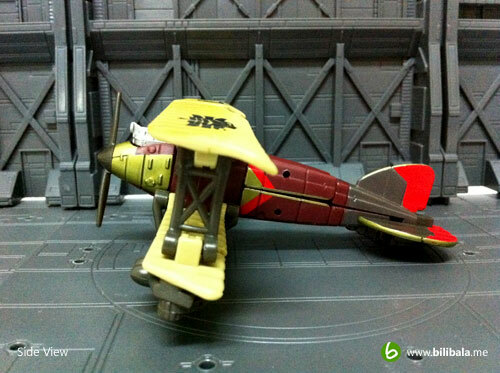 Previously i have done a review on a World War II P-38 Lighting fighter plane Transformer, the Highbrow. 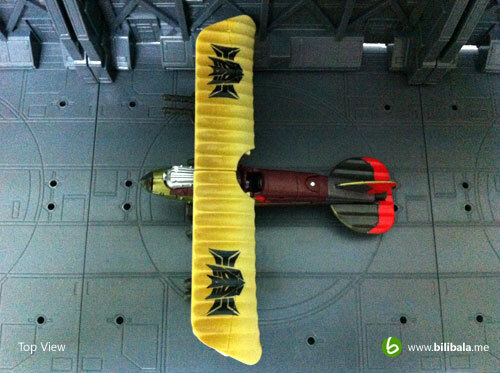 This time around, there’s another antique plane Transformer which is actually a World War I German Albatros D.III biplane changing robot with the name of Ransack! Quite a pretty neat alternate mode i would say as there is seldom an antique alternate mode for transformers. Frankly, i have grown much affection towards all these antique mode changing Transformers after Highbrow. Reason being, it is quite rare and unique to have them in my collection of hundreds modern car and airplanes based Transformers. Ransack only available in Scout class which is bigger size compared to a legend class but smaller than a deluxe class. Don’t underestimate the Scout class toys, despite being a small size, their transformation is quite complete and satisfying. Anyhow, this is my 1st Transformer toy in Scout class and i got this baby as a Takara Tomy with the same price as Hasbro from a local toyshop which is having a sales now. In the meantime, if you are interested in digging out more on this Ransack character, please click here. 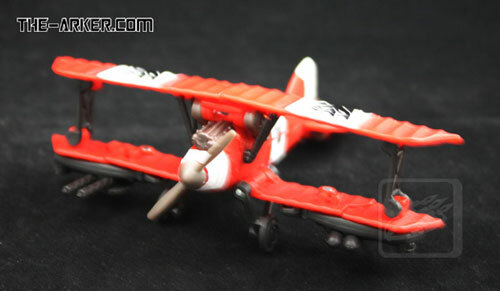 The alternate mode for Ransack is a German Albatros D.III biplane which is older than Highbrow P-38 Lightning WWII figher. 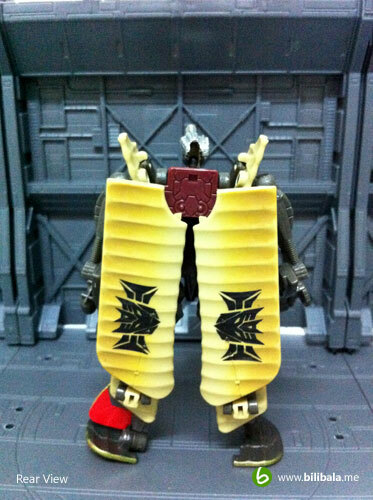 Therefore, you can see the alternate mode in a much simpler and less complicated details as the bigger Highbrow. 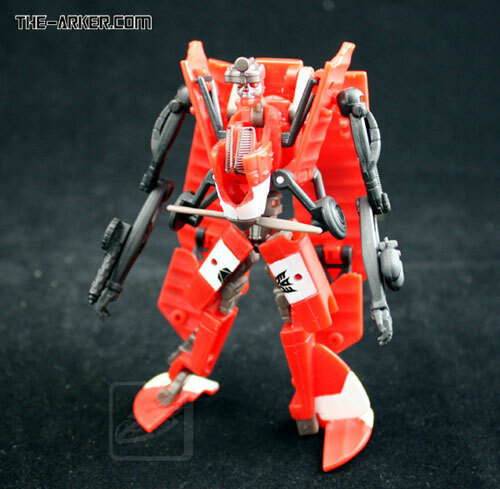 Despite being a Scout class, this alternate mode does have a lot of small details which really added value to it. 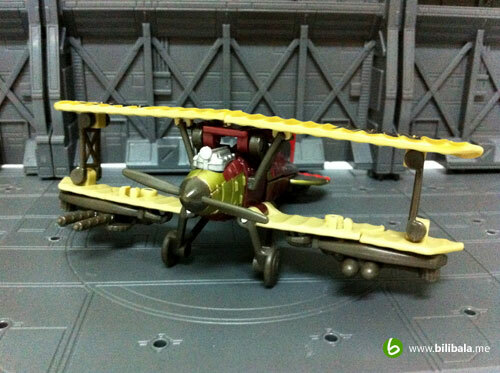 From the front view of the alternate mode, you can see the working propeller. 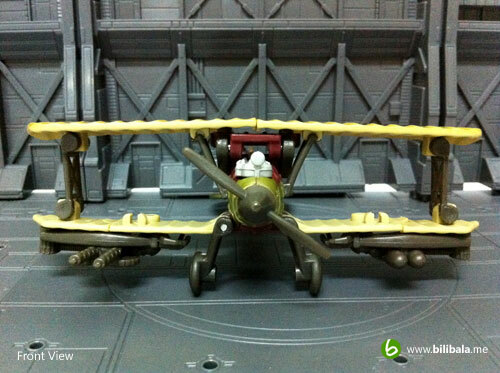 Moreover, you can see details such as the airplane engine (above the propeller – which is actually the head of Ransack) , a machine gun & bombs at the side of the wing and the landing gear (of course!). 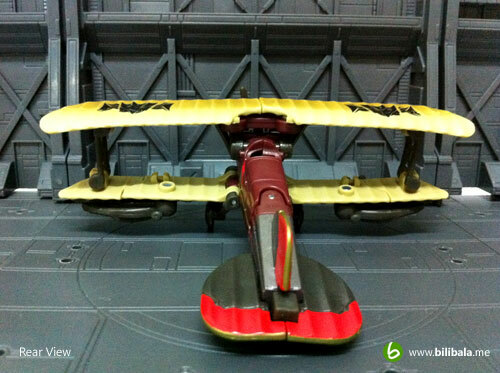 The coloring for the whole alternate mode is well done as it make use quite a few metallic colors to add in the overall detailing especially the yellowish body color and the metallic silver at the plane engine, etc. I particularly like the coloring done on both of the wings. It is being painted with a bit of “burnt” and rusty effect which you can see here. The 2 over-sized Decepticon insignia does give out the identify of him being the bad guy. 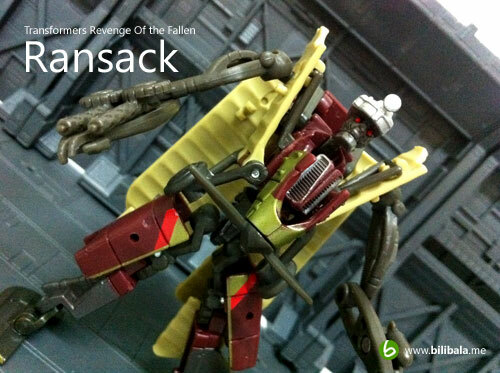 My 1st impression on Ransack: Skinny, bonny and zombie alike Transformer. 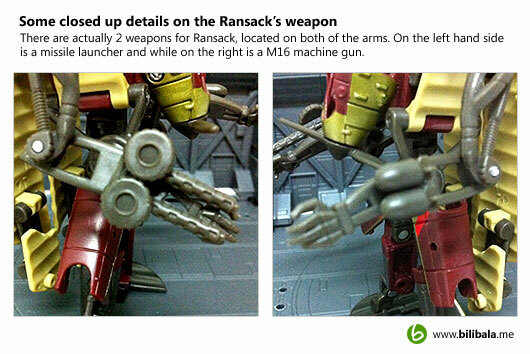 Frankly, Ransack has very skinny arm and leg structure and he does has a red-eyed zombie looking headpiece. The overall articulations for the robot mode is quite standard. 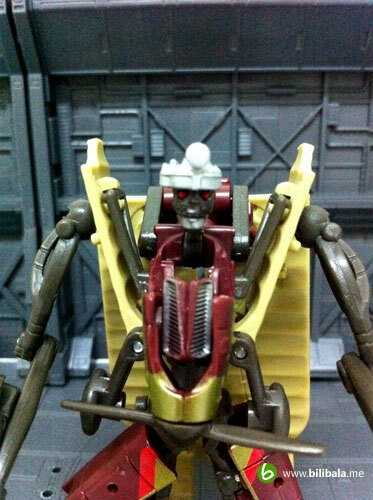 And one more thing to stress out, despite being a Takara Tomy, there are some joints of him which are really loose, e.g. the shoulder joints, the wing joints and the 2 sub wing joints. The 2 wings are being flipped down, kinda cute to see him from the rear view. In addition, it does give me an impression of him being a washing board. Here’s a closed up on his headpiece. Notice that the metallic silver thinggy on the red eyed zombie head is actually a head torch (which is like those head torches worn by modern miners) . His headpiece also reminds me of the skeletal head of Terminator T2. A point to note here, there are no light piping mechanism for him and the red eyes of his are purely painted. The 3rd mode: Battle Mode! Surprise! There’s actually a 3rd mode for this small but detail packed Scout class! This is what we call the battle mode for him. 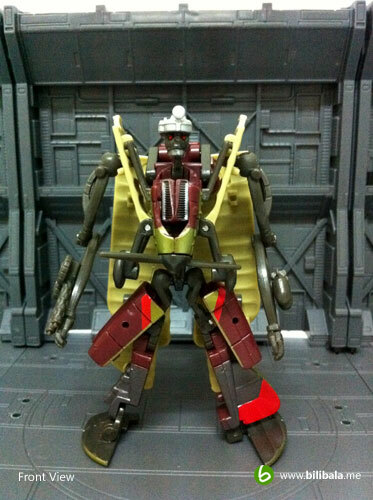 Much like a Macross Gerwalk with robot head popping up, this does give him a flying capability in robot mode as compared to other Transformers. 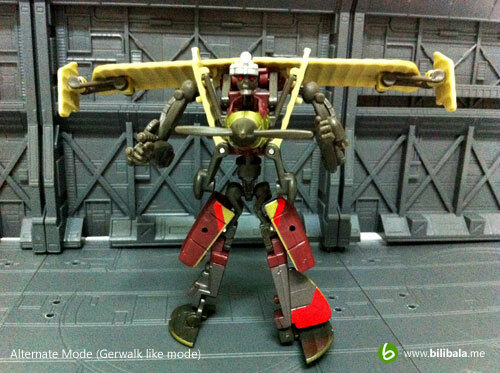 Kinda cool and the transformation to battle mode is simple and straightforward. 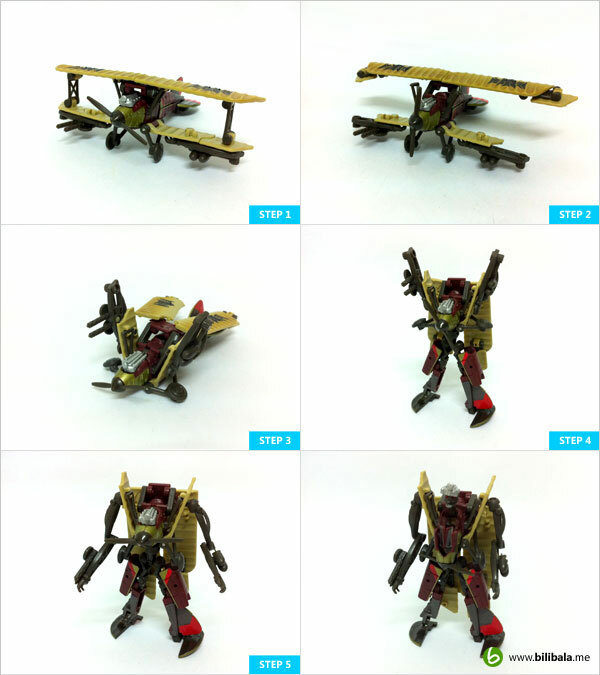 Transformation is quite simple but satisfying despite being a smaller class compared to deluxe. You still need to go thru some twisting and turnings in transforming him into alternate mode back and forth which is unlike those 3 -4 steps conversion of legend class. Anyhow, the ball joints on Ransack’s shoulders are especially loose which normally popped off while doing transformation. This does spoil the fun. Overall, this Ransack is really value for money and worth for a collection for its unique alternate mode. 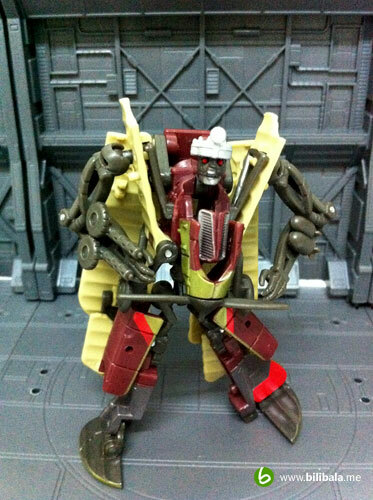 What’s more, you have a triple mode for a Transformer Scout class as well as great coloring done on this small figure! 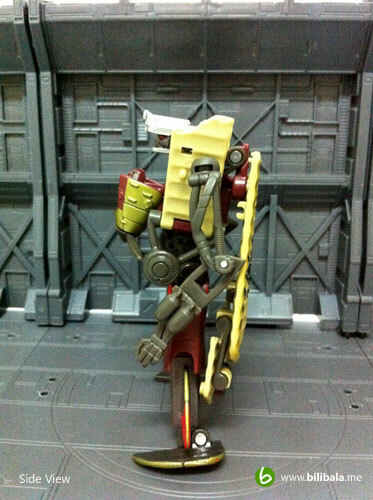 What i would like to say is, no regret of having him as a member of my Transformers family. My PCR (Personal Collection Rating) is 8.5/10. It will be a near perfect collection if it not because of the loose joints he has. More pictures from The-Arker.com. Enjoy hunting!